One of the most common causes of shoulder pain in America is bursitis. It affects millions in this country at any one point in time, and is more common than all other reasons for shoulder pain combined. Here are some FAQs on this very common condition. What exactly is bursitis and what is a bursa? A bursa is a soft tissue area that overlies muscle and acts as a protective element. It allows muscles to glide smoothly and not be irritated by the tissue that overlies the area. 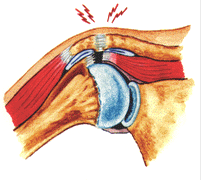 In the case of the shoulder, the area overlying the bursa is bone called the acromion. The bursa itself overlies the rotator cuff musculature and when healthy permits an incredible range of motion in every direction. The term bursitis refers to inflammation of this soft tissue. It does not refer to an infection, but rather Inflammation that makes it painful when a person moves the shoulder and when soft tissue rubs up against the overlying bony area. The additional term that is well-known for shoulder bursitis is called impingement syndrome. What symptoms do people have with bursitis and impingement syndrome? 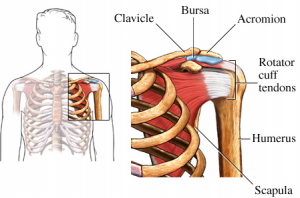 Typically when a bursa is inflamed, the person will have pain with range of motion of the shoulder as the tissue rubs up against the overlying bone. There may be some throbbing during periods of rest, but this should dissipate. If a person has significant pain during rest periods, further workup should be done to rule out an infection or tumor. The term impingement syndrome essentially refers to the fact that as the shoulder is moved, the inflamed bursa gets caught underneath the bone of the shoulder called the acromion. Then, it becomes a paradox as the soft tissue that is supposed to allow the muscle to glide is now actually causing it to become painful with range of motion. As mentioned, the most common complaint that patients have is pain with motion. Usually this includes forward flexion of the shoulder along with lifting the arm off to the outside or backwards. 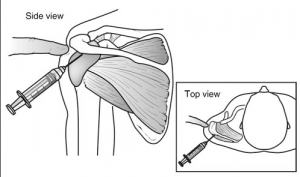 These are the directions that caused the soft tissue to get impinged underneath the acromion. Are there certain people who are at a higher risk for shoulder bursitis? The answer is absolutely. Starting in middle-age, individuals are more prone to developing shoulder bursitis. This may include those who routinely participate in overhead athletic sports, along with weekend warriors or those who garden a lot to do anything involving lifting their arms up repetitively. An example would be an individual in her 60s who begins to garden frequently when the weather changes. 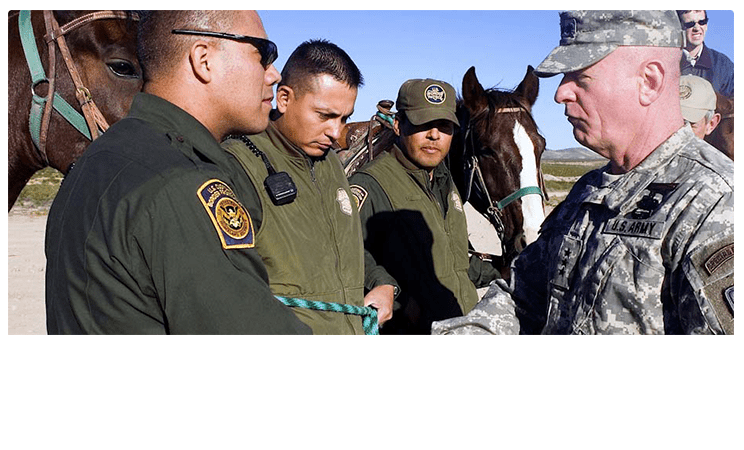 This may spark up information with the surge of activity. Or this may be a male who starts to work a lot on the house and is performing a lot of overhead activity. Additionally, a younger person who is an athlete may begin to experience shoulder bursitis and impingement syndrome due to overuse during sporting activities. In those who participate in jobs that involve repetitive shoulder motion, shoulder bursitis may result and require treatment with a workers comp doctor. Other than bursitis, why else might a person have shoulder pain? 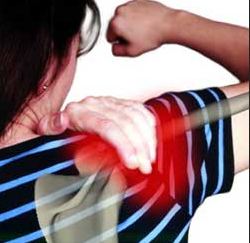 Far and away, most shoulder pain emanates from bursitis. However, some of the other reasons why one develops shoulder pain which may include degenerative arthritis of the joint, a tear of the rotator cuff musculature itself, inflammation of the biceps tendon, or pain emanating from arthritis in the AC joint. In less common circumstances, an individual may have an infection or tumor in the shoulder. These are much less common but possible. If the injury occurs on the job, an Arizona or Federal Workers Comp doctor can help elucidate the reason for shoulder pain. Most commonly, the history and physical along with the examination performed by the Phoenix Workmans Comp doctor will be confirmatory for shoulder bursitis. It is usually fairly straightforward, however, there also may be a necessary injection of numbing medicine into the area of the bursa. This area is called the subacromial space, and if the numbing medicine relieves pain with range of motion then it is confirmatory for the diagnosis. X-rays may simply show arthritis or a bit of an overhang to the acromion. An MRI may show a high signal in the bursa itself, which means there is some swelling there. On the MRI, the doctor will also look for some degeneration or tearing of the rotator cuff musculature. What treatments are available for shoulder bursitis? Standard treatment for shoulder bursitis consists of over-the-counter anti-inflammatory medications and Tylenol. In addition, physical therapy is a standard treatment and may include stretching and strengthening along with ultrasound, electrical stimulation and massage. The patient should be given a home program as well to facilitate resolution of inflammation. One of the main treatments that a workers compensation pain doctor can also perform is an injection of cortisone into the subacromial space. This may be performed under image or ultrasound guidance, or the injury doctor may simply be able to place the needle using landmarks. Should conservative treatment fail, shoulder surgery may become necessary which would include an arthroscopic outpatient procedure known as a subacromial decompression. How well does treatment for shoulder bursitis work? Nonoperative treatment for shoulder bursitis typically works exceptionally well over 95% of the time. The treatments are often able to reduce the pain within a few days to a few weeks, and it is often a self-limiting situation. Injections may be given every few months, and if they are not helping then excellent outcomes are achieved with the arthroscopic procedure. 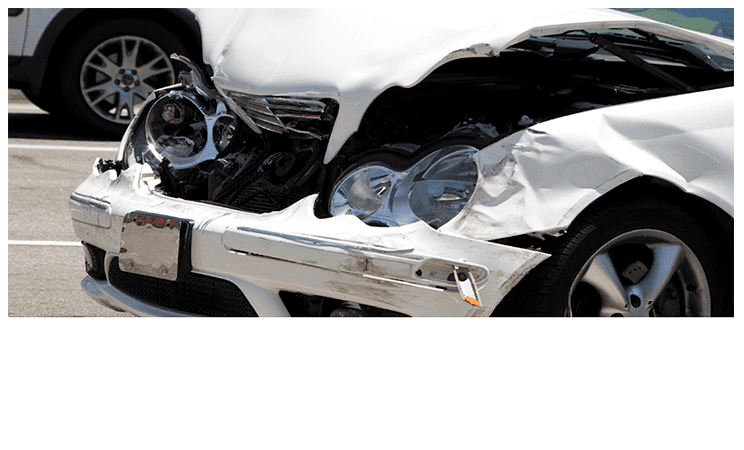 Arizona Injury Medical Associates treats shoulder injuries sustained either as part of personal injury case or a work injury. Thankfully, most shoulder bursitis is possible to be treated nonsurgically with the variety of treatments available. These include medication management, physical therapy, acupuncture, injections and more.